Tabasco is the indisputable “Grandfather” of American hot sauces, but in the grand scheme of things they are still playing catch-up. And so here is a review of their “Buffalo Style” Hot Sauce. 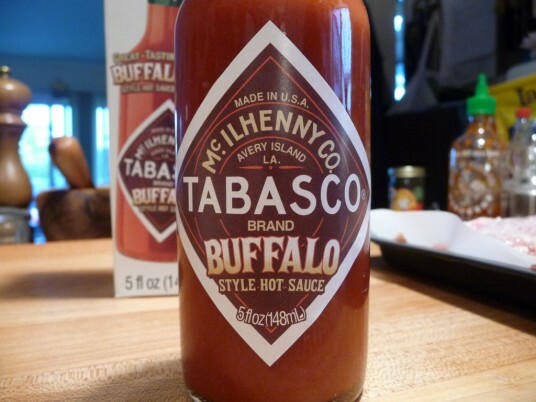 Following in their footsteps of adopting Habanero, Chipotle, Sweet and Spicy, and Garlic, the McIlhenny Family has finally jumped on the “Buffalo Style” sauce bandwagon… and as a result have produced a superior sauce that trumps the old stalwart of Franks RedHot. Texture & Appearance: – Bright red, with a light-to-medium thickness. A good looking hot wing sauce. Taste Straight Up: – Smacking of garlic, it still produces that classic Tabasco taste. Heat Level: – Mildly hot… yet milder than Tabasco’s original sauce. 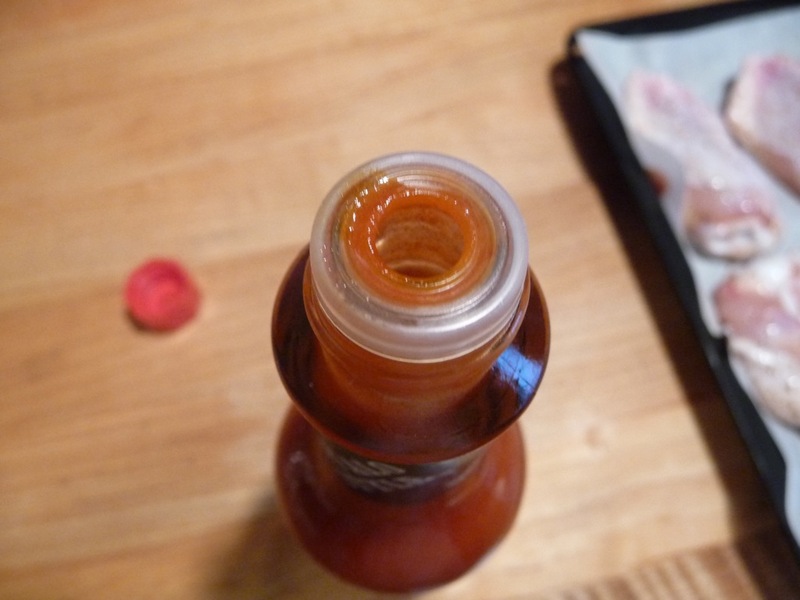 Tabasco includes their standard “restrictor cap” – while it does sport a larger opening than most caps, it is unnecessary here, as the sauce is not so hot you need to restrict the flow. We popped it off immediately. Overall Rating (Taste on Food, Final Thoughts): – Remarkably good on fried chicken wings. In my opinion, it’s better than Frank’s, the original “buffalo wing” sauce. But having to use almost a full 5 oz bottle for just 12 wings makes it considerably more expensive than most wing sauces. On the bottle of Tabasco Buffalo Style Sauce is a recipe for “Buffalo Chicken Wings From Scratch” that we do not agree with, but have modified the recipe to fit us and you, our readers. Because, on the bottle, it suggests you bake the wings on a foil-lined pan in a 425° oven for one hour. Okay, you might want to bake your wings if you are really in a pinch, but please don’t. Unless you are going to follow our 3 Step Wing Recipe – Bake, Fry, Toss. 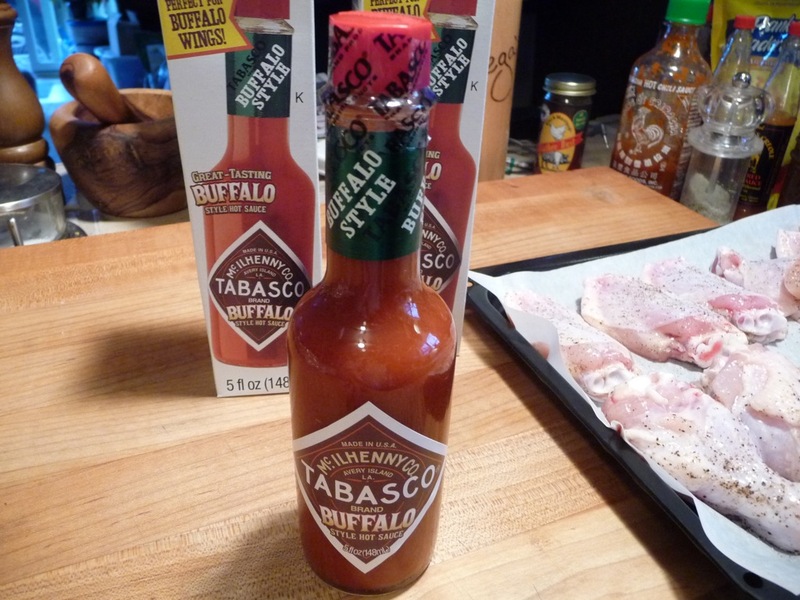 The Tabasco Buffalo Style Hot Sauce is so new, it’s not in their current printed catalog (2010-2011), and so far is only available in the 5 ounce bottle. Since Tabasco offers all of their other sauces in 1 Gallon jugs, I imagine it’s only a matter of time until this flavor is also available in other sizes. Shop the Tabasco Country Store online for this and other great Tabasco products. Great review and photos. Was sold on the sauce until you mentioned that it was *milder* than the original Tabasco, which to my tastebuds is already way too mild to be of much use. But from the photos the texture of this sauce appears thicker than the original, and it sounds less vinegary, and those are definite pluses in my book. Hope the McIlhenny folks get their act together and market it in larger bottles if it’s meant to be a wing sauce, especially a mild one. Gloria, Marilyn swears the buffalo has more heat and pepper flavor than the original Tabasco. If you like Frank’s you’ll enjoy the Tabasco too. And I fully agree they should be making a much larger bottle for wings. You said that this was milder than original Tabasco, but you give this a 2 1/2 out of 5 on heat. Do you really consider original Tabasco to be that hot? 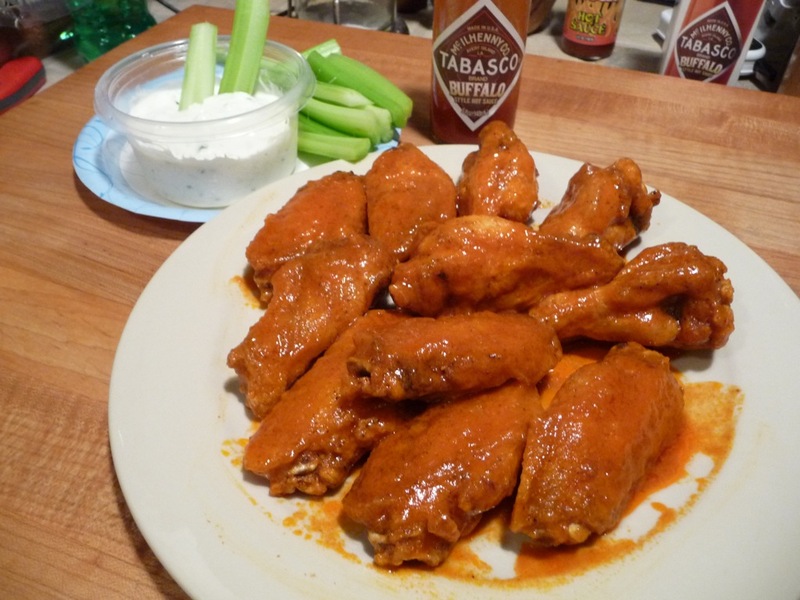 To me, buffalo-style sauces closely approximate what is applied to chicken wings: a creamy, tasty blend that contains butter or some kind of oil/butter substitute. Does it taste like this on its own? 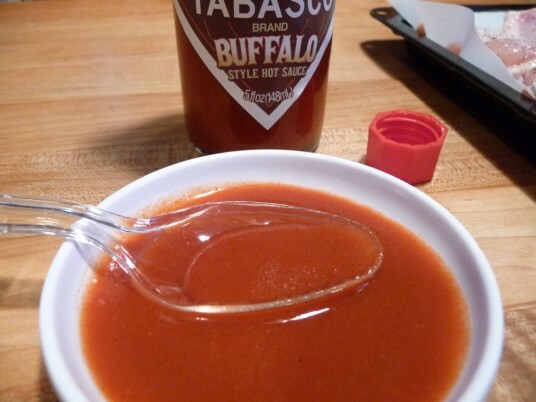 What is a buffalo-style sauce to you? I think even though Frank’s contains garlic, it’s really not that much of a garlic sauce and closer to a Louisiana-style like Tabasco, et al. You add butter to Frank’s and then you have a buffalo sauce. Thanks for pointing out the butter. I forgot to mention we DID mix 1/3 cup of butter into the sauce for the dozen wings. We ended up with a classic buffalo stye wing with an ever so slight Tabasco twist. I may have been a bit over-zealous with the heat rating. Since I grew up on Tabasco sauce and didn’t know better until I found HSD religion, these are not too much of a stretch for me. Wow! Better than Frank’s? Have seen this in our local grocery, so we’ll have to give it a shot! As always, your reviews get my forehead sweating! Thanks, Brian! I would love to know what you think of it Kevin. Marilyn thinks I’m nuts and Scott thinks I’ve over rated the heat level. Just found this site. And let me say I have enjoyed reading your reviews on all the different sauces and such. What sauces would you suggest for someone new to the spicy sauces scene. Currently I enjoy putting Tabasco on a lot of different things from eggs to pizza to several Mexican dishes. I just tried Sriracha and enjoy it. Any sauces that you would recommend? 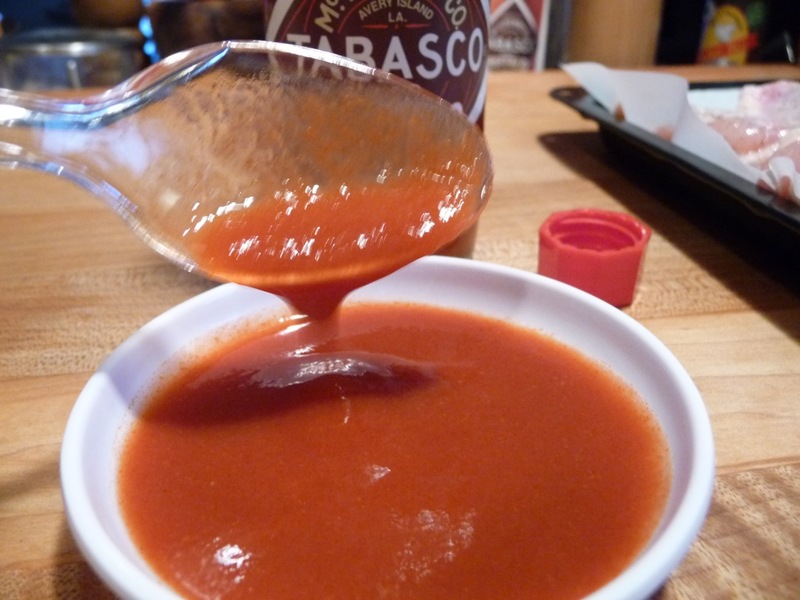 Interested in a sauce that is a similar to Tabasco in that you can put it on almost everything. I noticed no one had replied to your question, so I thought I’d chime in. I love hot sauce so I’ve tried hundreds and I would recommend: Cholula, Frank’s, Tapatio, Valentina (this may be regional, I’m from San Diego), Louisiana, are some that I can think of off the top of my head. I find some really good ones I’ve never heard of in the Hispanic section at the supermarket. Anyway hope that helps. I mix the sweet and spicy,and chipotale half and half and use as a dipping sauce for my mudbugs!!Fantastic!!! It’s kind of vinegary, and definitely has that Tabasco base flavor. Do you like *any* of the Tabasco flavors other than the Classic? I have found that baking @500 deg for two 20 minute sessions thoroughly renders the chicken firmly, crisply cooked regardless the sauce – at least in my oven (they all vary). As for Tabasco, one of my favorites is with chips of any kind. At this moment I am consuming the Buffalo style with Tostitos (the Touch of Lime kind) alongside my Cuervo and Grand Marnier margarita. I am at home and not planning on driving anywhere, folks. Years ago I was introduced to Tabasco and Cheezits by an oral surgeon, Dr. Bob, who claimed to have invented the combo. I have always loved the Tabasco twang, because it is not TOO hot. Habanero I find goes over the fence, but that’s just me. My favorite breakfast is fried potatoes, onions and sriracha with bacon. Just thought I’d mention that. Good wings baking tip, Phil. I put Tabasco on my Cheezits all the time. Love the Big Cheezits that way. Sriracha rocks for breakfast! Eggs, potatoes, everything but the waffles! Will give the Cointreau a try. Given up on Triplesec, Grand Marnier is smoky. My sriracha of choice is Shark Brand, inexpensive and Thai. I’ve had the Shark Brand srirachi. It’s quite different than the thick, garlicky Huy Fong you find on grocer shelves. We usually order it from ImportFood.com they offer a great selection of Thai sauces and foods. They have great customer service. Tell Jerry Good we sent you! I have always wondered why the heck “Tabasco” sauce is so expensive. They aren’t using special Tabasco peppers are they? its just cayenne? Just curious.